Wearing a ring to indicate betrothal to another person is a tradition that dates back centuries — although the tradition of gifting a diamond wasn’t cemented into the public psyche until 1947. And while it remains the norm today, some people are putting their own twist on the tradition and getting their finger pierced with a diamond instead of putting a ring on it. 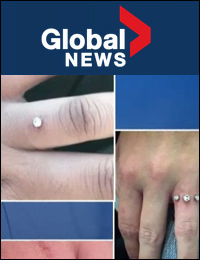 The trend in dermal engagement piercings has recently taken hold of Instagram, but some professionals are warning against them. A dermal piercing consists of an object being partially embedded in the skin, and while it may seem as innocuous as piercing your earlobes or nostril, it comes with a host of unique complications. The issues don’t end there. Kellett also points out that there’s the risk of infection that comes with poking through the skin, and the increased possibility of trauma. “If you catch your finger on something, it could cause tearing or scarring, and scarring, in particular, can cause significant problems in range of motion and function of the finger. Unlike other parts of the body, the finger doesn’t have a lot of tissue and it’s hard to graft over that area,” she says. Interestingly, these concerns are not only coming from medical professionals but from people who work in the body piercing industry, too. Whitny Lapointe, a body piercer at The Village Ink in Toronto, says she won’t perform finger piercings, nor will most reputable studios. In addition, it won’t last very long. If you’re lucky and careful, Lapointe says, it’ll stay in for a few months, but it’s rare that it’ll stay in place that long just based on how active we are with our hands.